Iola Johnson during her prime Belo8 years and in recent times. 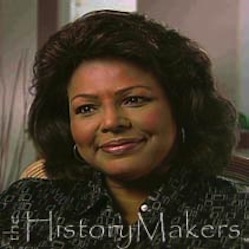 Note to readers: Iola Johnson, Dallas television's first black news anchor, teamed with Tracy Rowlett to form a dominant duo at Belo8 from 1975-85. Then she abruptly quit and had far less success in other broadcasting venues before re-teaming with Rowlett to co-anchor CBS11's 4 p.m. newscasts from 2000-'02. The following article, which first appeared on March 2, 1985, documents her last night at Belo8, on Feb. 28 of that year. Iola Johnson, trailblazer, set out for paths unknown Thursday night after anchoring her last newscast at Channel 8. Tracy Rowlett, her anchoring partner for the last decade, gave Johnson a vase of yellow roses at the end of the 10 p.m. newscast. The station said goodbye with a flowery videotaped tribute set to Kenny Rogers' Through the Years. "One of the most consistent questions I've been asked at Channel 8 is, 'Are you really a good friend of Iola's?' " Rowlett said before nodding and handing her the flowers. "This is very, very touching," Johnson said. "I had asked that nothing be done. I was simply going to say goodnight. And it's very, very touching. Thank you all. It's been a good 11 and-a-half, 12 years here at Channel 8." With that, Johnson said goodnight, thanked Rowlett and hugged him briefly while sports anchor Dale Hansen and substitute weatherman Jim Littleton looked left out. Earlier in the newscast, Rowlett surprised Littleton by adjusting his tie after telling him, "This is Iola's last night. You want to look sharp tonight." Johnson, the first black to anchor a newscast in Dallas, has declined to explain why she is leaving Channel 8, or what she hopes to do. Management's version is that she wanted far more money than Channel 8 would pay her. Contract negotiations broke off on Jan. 16, with news director Marty Haag explaining, "I think Iola has come to a point in her career where she feels like she would like to see if she can go to one of the major markets, a market bigger than this one, and hit a home run." Asked Friday whether she feels that way, Haag said, "I really don't know." Johnson asked him this week, Haag said, to fill out papers for a William Denton fellowship for journalism at the University of Chicago. "She has expressed some interest in trying to do something of that sort. She said she was interesting in doing political writing at some point, because that was her original interest," Haag said. Johnson graduated from the University of Arizona with a degree in journalism and political science. Rowlett and Johnson became an anchoring team in 1975, two years after she joined Channel 8 as a weekend anchor and reporter. She can be moody, gracious, guarded and generous. In short, a "complicated" person, "an enigma," Haag said. During periods of contract negotiations, Johnson tended to be trying and troublesome. But during other "times of stress" at Channel 8, she "has been a Rock of Gibraltar," Haag said. "She was a role model for a lot of aspiring minority and women journalists," he added. "It was a helluva run, too. From the time that she and Tracy were put together, Channel 8 news took off in the ratings. It is rare for an anchor team to be together as long as they have." "I never in my life wanted to be a television personality. So when it's all over for me, I'll be very satisfied and content with my new life. "If I just wanted my face on the tube every night, I'm not sure what would happen to me when it was all over. I'd like to think most people are not doing anchor work simply to feed their ego. I feel sorry for those who are doing that, because they're setting themselves up for a big fall. "Why do that to yourself? I don't even like to get accustomed to the glamour or notoriety associated with being an anchorperson. Because if it ends, I don't want to be devastated by it."